COMEDY. Four desperate college students fight for the use of a small, cramped bathroom. Semi-finalist, Theatre Oxford, 2006. 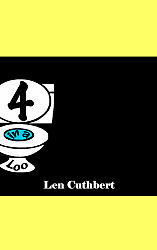 Included in the short play collection "4 in a Loo." Len Cuthbert has been involved in theatre for children and youth since the late 1980s and is the creator of a summer theatre camp. Mr. Cuthbert has had several plays produced and published and lives in Ontario, Canada.